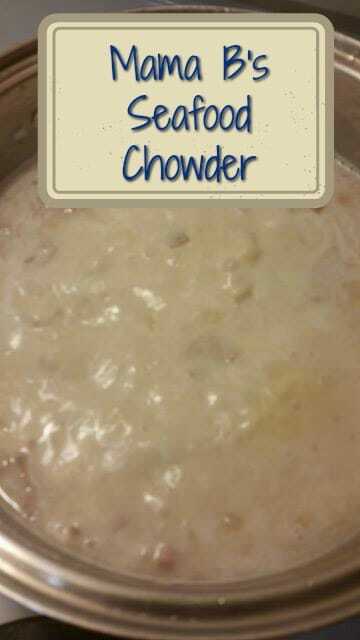 I did some research for my seafood chowder and tried to make up my own, and I sort of succeded. I ended up taking bits and pieces from several recipes and adding it all to a potato soup recipe that my sister gave me. It turned out great! My Man loved it, as did Damian who is a super picky eater! You could change the seafood you add to this recipe. I had planned on putting chunks of cod fillets in it, but I had forgot to pick some up. I used imitation crab simply because Damian, my son, can't eat the real crab. 1 small pkg imitation crab, cut into chunks. 1/4 cup flour whisked together with enough water to make a pourable paste. Fry up the bacon, onion and garlic in a dutch oven, until onion is softened and on the clear side. Pour in the chicken broth and add the diced potatoes. Cook until potatoes are fork tender. While the above is cooking, remove tails from thawed shrimp. ( you can use uncooked shrimp, just make sure to peel and devein them). When the potatoes are cooked, add in the 1/2 & 1/2 milk. I poured in just enough to turn the broth white , probably about 2 cups. You can add more if you like your chowder whiter. Add the seafood and heat through. Meanwhile, mix the flour and water together until you can pour it into the bubbling broth to thicken. You can add whatever seafood you prefer. Next time I make this, I will probably add some chopped celery, and grated carrot to it along with some clam juice, a can of baby clams, and definitely i would add the cod chunks as well. I also used way more than 30 shrimp and 30 scallops. I bought frozen bags of each and used both bags because I had forgotten the cod.